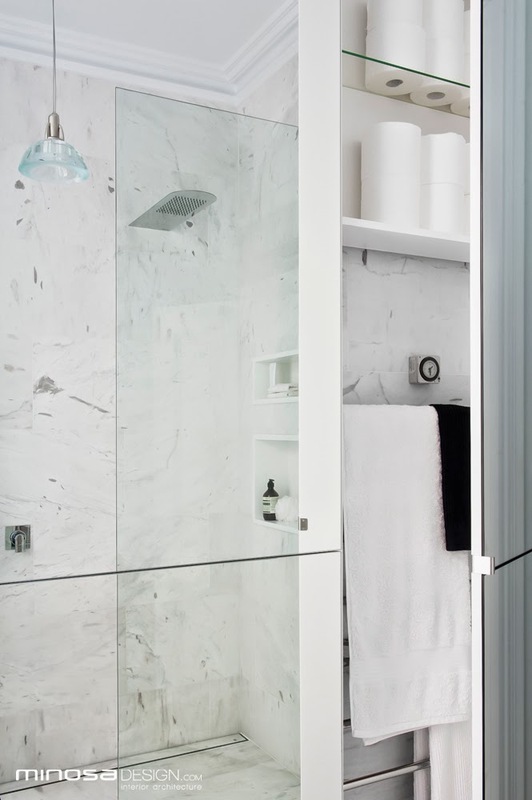 Minimalist bathroom space where everything has a home. 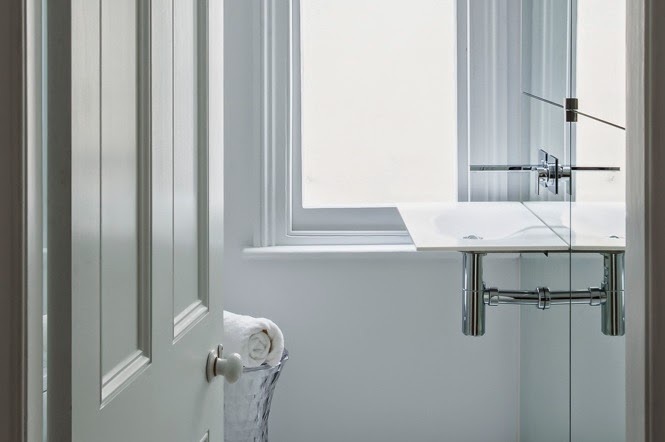 Fo this style of bathroom to be a functional success you must apply thought to the client needs and lifestyle. A small footprint and the desire to have every thing away from view left the designer with out a lot of options. Although the window was north facing the closeness of the neighbour meant that only a small amount of light would filter in. This was a challenge, cutting edge minimal spaces are only successful when the lines are clean and the spaces functional. 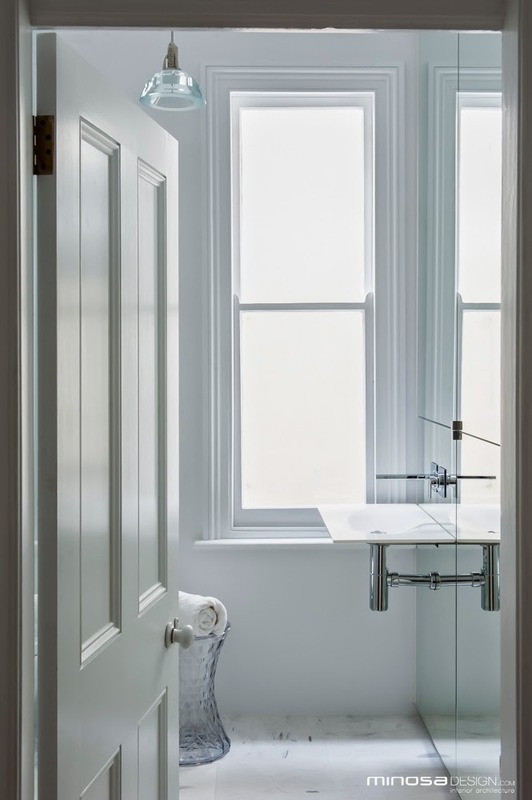 The obvious choices were clear from the beginning of the design development, the toilet was best placed to the north, the basin needed to be on the eastern wall and the shower was to be on the southern side of the room. Once the fixtures where positioned the main problem was how to get ample storage to hide everything these clients had and to also add light and make the space feel larger. 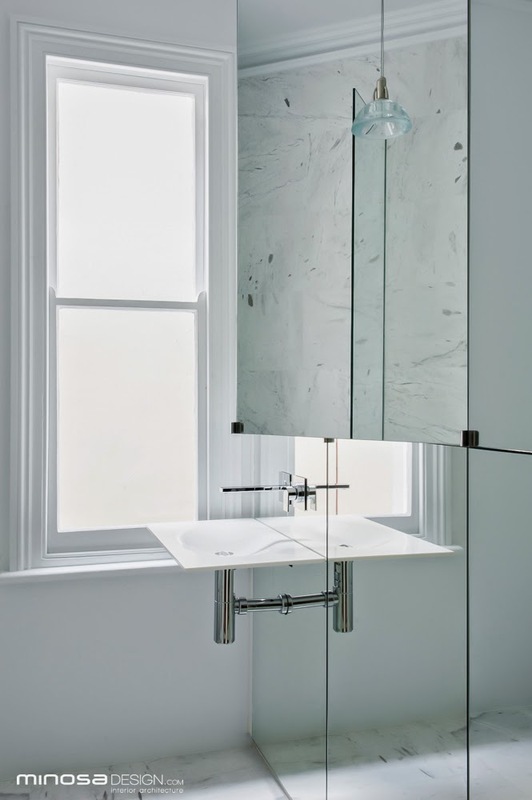 On the basin, the designer chose a very streamed line solution, made from Corian and only 12mm thin it magically floated from the wall of mirror. 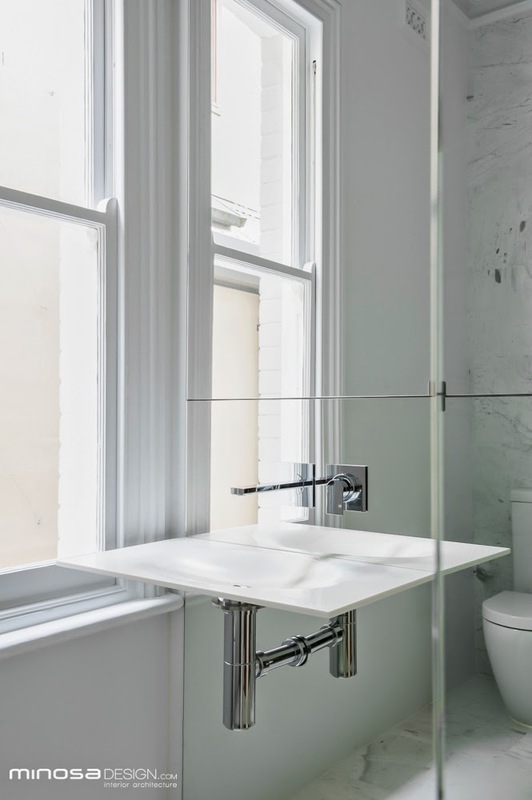 The wall mounted taps also float thru the mirror, above the basin and to the right is very generous storage for everyday personal effects. 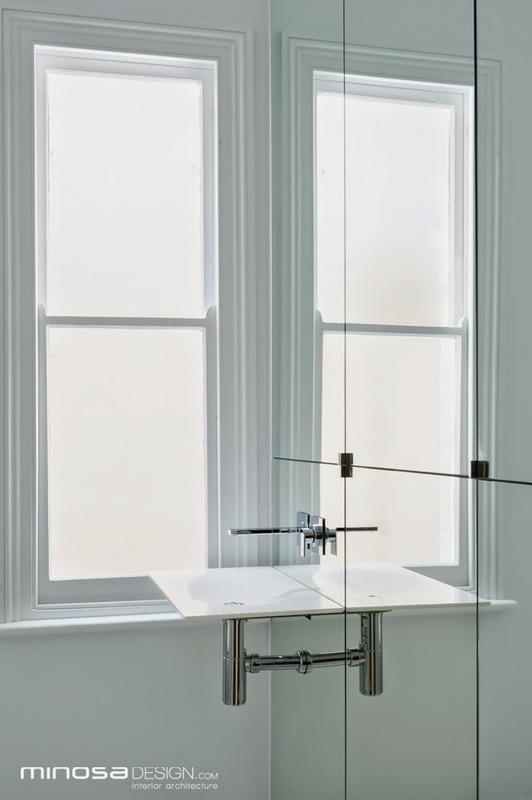 To create a further streamline addition the designer chose the 3mm shower soaker by Gessi as it's refined detail and thinness defies gravity and sites so perfectly in the minimal space. 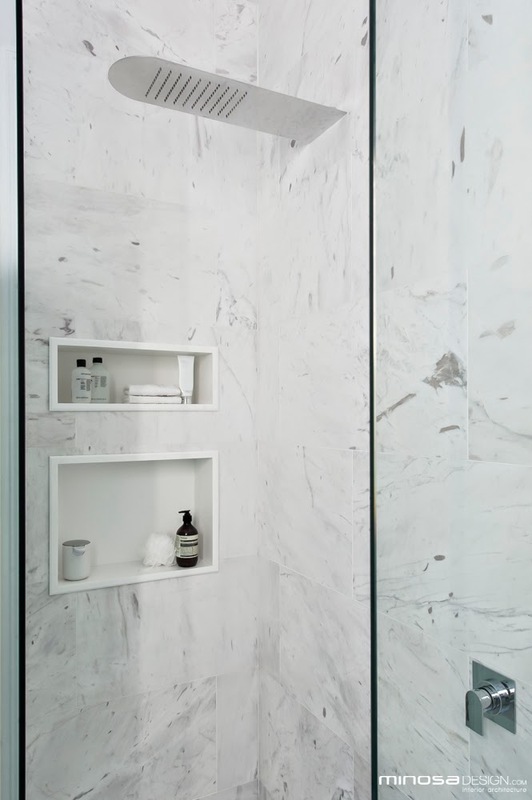 Tow corian shower niches were created for ease of cleaning and to house everyday elements for the shower. 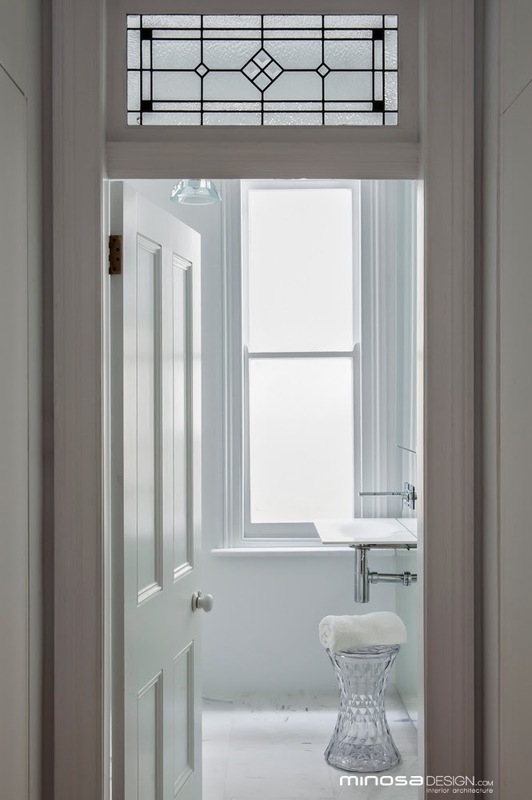 The final thing to chose was the palette, the designer needed warmth, with the period features there was a need to tie back to the period. 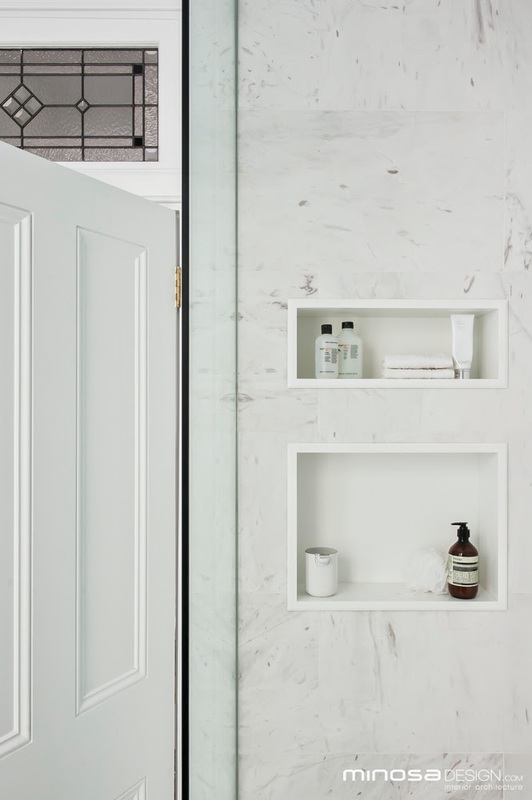 Alba marble was selected for Its resemblance to the period as carrera was to veiny for the client, Alba offered a consistency the clients loved and also added movement and nature to the space. The lighting was simple like the over all appearance, feature light to the centre and three. Down lights obove the wall to wall storage.